Do not play with the samples unless you really know what you’re doing. You have been warned! All Windows versions before Windows 10 are vulnerable to the WannaCry (WannaCrypt, WannaCry, WanaCrypt0r, WCrypt or WCRY) ransomware if not patched for MS-17-010. The ransom is between $300 to $600, there is code to delete files in the virus so it’s not just a threat. The worm loops through every RDP session on a system to run the ransomware as that user, also installs the DOUBLEPULSAR backdoor and it corrupts shadow volumes to make recovery harder. If the website www.iuqerfsodp9ifjaposdfjhgosurijfaewrwergwea.com (ayylmaotjhsstasdfasdfasdfasdfasdfasdfasdf.com in the b9318a66 version) is up the virus exits instead of infecting the host. The domains have been sinkholed, stopping the spread of the ransomware worm. It uses the ETERNALBLUE MS-17-010 vulnerability to propagate, vulnerability developed by the Equation Group (closely-tied to the NSA) and leaked by the Shadow Brokers. b.wnry – Ransom desktop wallpaper. s.wnry – ZIP archive containing the TOR client. Taskdl.exe – Deletes all temporary files created during encryption. Taskse.exe – Runs given program in all user sessions. msg directory – Language files. Each infection generates a new RSA-2048 keypair. The public key is exported as blob and saved to 00000000.pky. 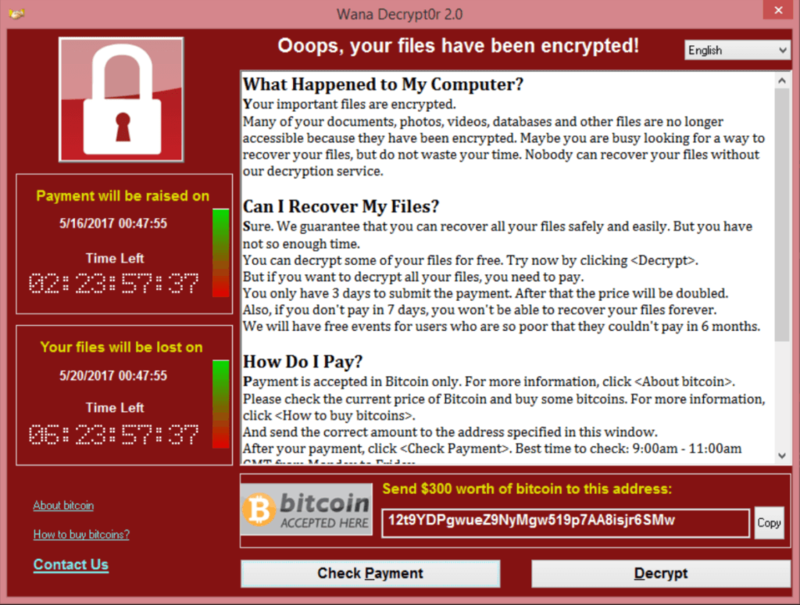 The private key is encrypted with the ransomware public key and saved as 00000000.eky. Each file is encrypted using AES-128-CBC, with a unique AES key per file. The AES key is encrypted using the infection specific RSA keypair. Malware tries initially to open 00000000.dky, if it is available, will import the key into Crypto API object. Presumably this would be decryption key from the authors of ransomware. If cannot open *.dky file, it will generate new RSA key pair of 2048-bits. The public key is exported as blob and saved to 00000000.pky. Private key is exported as blob and encrypted with ransomware public key before being saved to 00000000.eky. The RSA public key used to encrypt the users RSA key pair is embedded inside the DLL. The AES-128 key generated for each file is derived from CryptGenRandom which is cryptographically secure and is not known to have any weakness. The AES keys are encrypted using the users public key in *.pky. In order to decrypt, the users private key is needed, which is encrypted using a public key owned by the ransomware authors. The malware is not using HTTP to communicate to the C2 servers, but a custom protocol. Hacker News discussions: 1, 2, 3 and 4.